1. Select the instrument(s) you wish to generate an export for and select “Export to MT4”. Once you select the MT4 Export option, the settings screen below will show. 2. Select the begin and end date of your export. The system will export all data between these ranges (if its available). You can choose the “quick pick” buttons such as “Last 1 year” to quickly select a date range. Tip: If you have not already downloaded data for a particular date range, Tickstory will automatically do this for you. There is no need to explicitly download data first before exporting. 3. By default, your export will only include data from the standard trading hours, excluding the weekends. If you wish to include any available weekend data in your export, check the “Include weekends” box. If there is no trading data for the weekend and you select this option, flat bars will be generated for this period. 4. 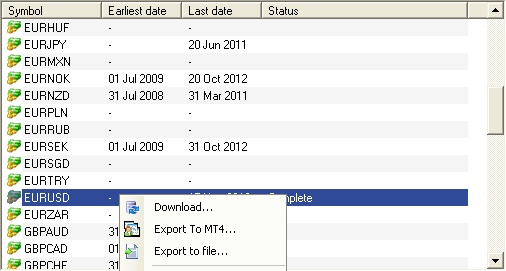 Select the time frames that you wish to generate the MT4 export files for by checking the appropriate boxes. You will need to export data for those time-frames you wish to back-test in (for example, if you have an EA that uses the 15-minute time-frame, you should select M15). Generally speaking, it is recommended that you generate for all time-frames. If, for reasons of minimising disk-space usage, you wish to only generate specific time-frames you can un-check those that do not apply. Note: When back-testing your EA, you will need to export data for every time-frame that you wish to back-test for. If you have not exported data for a time-frame that you are back-testing with, the system will generate an error message and/or not produce the correct results (and your back-test will not show 99% quality). Generate HST will ensure that the Metatrader history files are created. Generally speaking, you should always ensure this option is selected (this feature is for advanced users only). Make FXT read-only will ensure that all the exported files are marked as read-only so they cannot be over-written inadvertently. Overwrite existing files will ensure that the system does not halt the export in the event files already exist. Suppress volume info will cause the export not to output any Volume data. 6. Select the timezone for which all time-stamps will be adjusted to. By default, the time-zone shift is set to 'None' which means that the time will remain in the instrument's native time-zone. The native time-zone can vary for each symbol. For Forex pairs, the native time-zone is usually UTC. By selecting a specific time-zone, you will convert all the time-stamps to that timezone including any daylight-savings (DST) shifts that may be applicable. For example, if you select “EST +7:00 - New York Trading time”, then the all Metatrader charts will be in that time-zone, automatically accounting for any daylight savings changes. See the section on “What MT4 export time-frame should I choose?” for further information on time-zones. 7. Select your Metatrader Installation location. If you have already set this location up in the Metatrader configuration, then it will default automatically to this location. The system will show you the directories that the HST and FXT will be placed in. Tip: Advanced users can still alter the HST & FXT directory locations if they wish to place it in some other location. 8. Press the OK button. The system will now begin generating the extract and display the percentage complete. NOTE: Make sure your MT4 terminal is not running prior to generating your export otherwise you may an error that the files are “in use” when the export commences. 9. Once the export has completed, you can begin your MT4 back-testing by launching Metatrader.